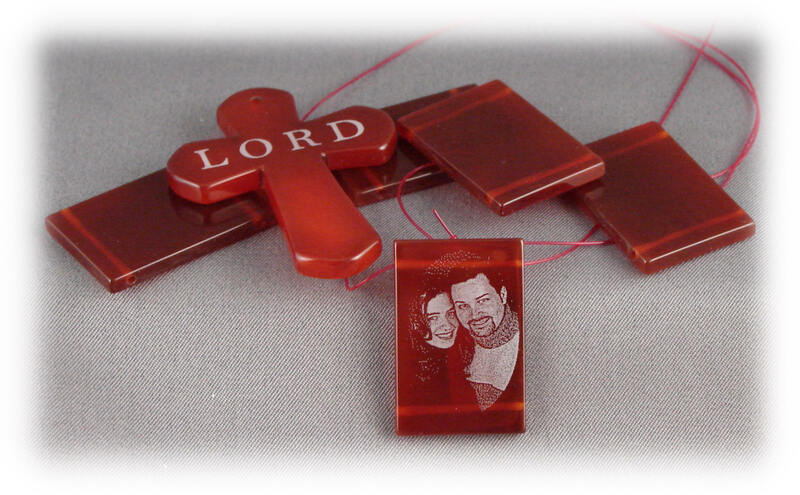 Laser Engravable Jewelry - Engravable Black & Color Onyx Jewelry - Page 1 - LaserSketch Ltd. Custom made Laser Engravable Jewelry of Black Onyx, Colored Onyx, Mother of Pearl or Paua, (Sea Shell), mounted in 92.5 Sterling Silver. Most of the Jewelry Illustrated in full size for clarity. 309GR: Rectangle Green Onyx Pendent mounted in Sterling Silver, 7/8" wide x 1" long. 309BLU: Rectangle Blue Onyx Pendent mounted in Sterling Silver, 7/8" wide x 1" long. 309RD: Rectangle Red Onyx Pendent mounted in Sterling Silver, 7/8" wide x 1" long. 345 BLU/MOP: Blue Mother of Pearl with Flip side White Mother of Pearl Pendant Mounted in Sterling Sliver, Engravable Areas, 11/16 inch Diameter. 345 GR/MOP: Green Mother of Pearl with Flip side White Mother of Pearl Pendant Mounted in Sterling Sliver, Engravable Areas, 11/16 inch Diameter. 518BO: Very Large Black Onyx Vertical Rectangle Pendent Mounted in Sterling Sliver, Engravable Area, 2 inch x 7/8 inch. 530BOHO: Very Large Horizontal Black Onyx Oval Pendent Mounted in Sterling Sliver, Engravable Area, 3-3/16 inch x 1-15/16 inch. 823BO: Rectangle Black Onyx Pendant Mounted in Sterling Silver, Engravable area 7/16 inch x 5/8 inch.